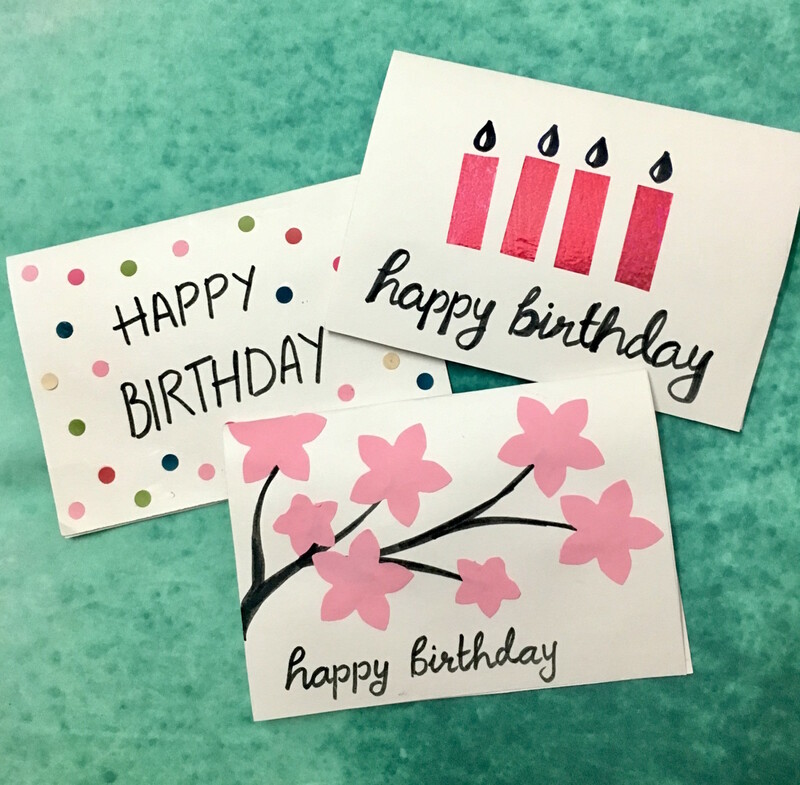 These greeting card tutorials are super easy and very affordable to make. 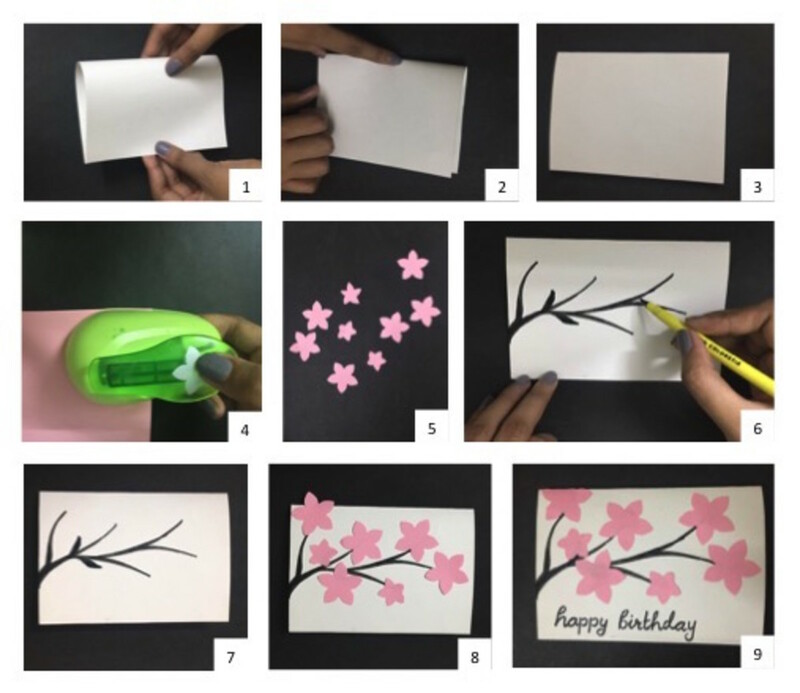 You may already have things lying around at home that can transform any blank piece of paper into a greeting card to show your dear ones your love towards them. Not only that, these take no more than five minutes to make after you've collected all the materials. I promise! This greeting card would not only make a cool greeting card for a birthday, but also for other occasions like Mother's Day, Valentine's Day (you can even replace flowers with hearts). Here's how you can make this card. 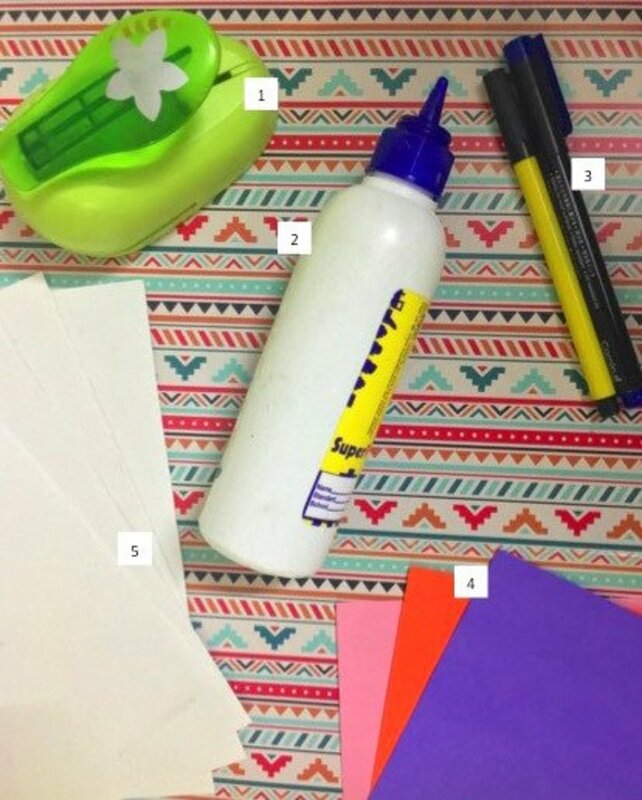 The things you will need for the blossom greeting card are as follows. You can, of course, make changes as per the availability of things. Take a rectangular white cardstock and fold it in half. This will become your base of the card. You can also choose other colors of the cardstock. It is totally up to you. It is better to use a thick sheet as it will give structure to your card and make it look professionally done. Optional: You can cut your white cardstock to make mini cards as well. Take your flower punch and any colored sheet of paper and punch a few flowers from the paper. I chose the color baby pink, but literally, any color would look good. Using a punch for this will make it easier for you to create uniform flowers and will do the work almost instantaneously. If you a regular crafter, it is better to invest in one as it can be used in tons of projects. Optional: If you do not have a flower punch, you can also cut them out using a pair of scissors. Just draw your flower pattern and cut them out. Remove your punched paper which will now be in the flower shape. Take out as many flowers as you wish to put on your card. The next step is to take your black marker or black pen and draw branches across your card. This you should do free hand as it will give you a natural looking tree. You can also use other colors of marker. Brown shade will also look good for the branches. The next step is to take your paper flowers and start sticking them in whatever manner you like using glue. You can also cut some of the flowers, like I have, to make them look smaller from other flowers. It will give the card a natural look. 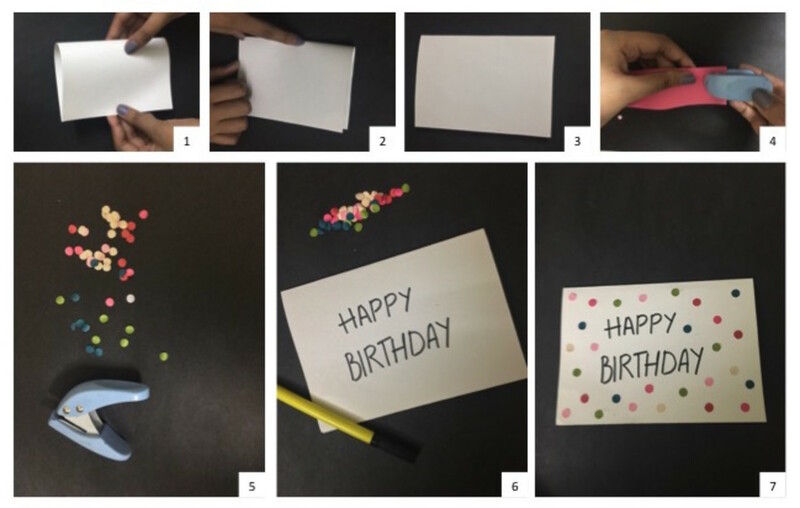 The last step is to add your Happy Birthday message using your marker and finish the card. Your card is now complete, ready to be handed over to that special person. This card is literally the easiest and the least time-consuming greeting card anyone can ever make. I bet someone can make a Guinness World Record, for the fastest handmade card. 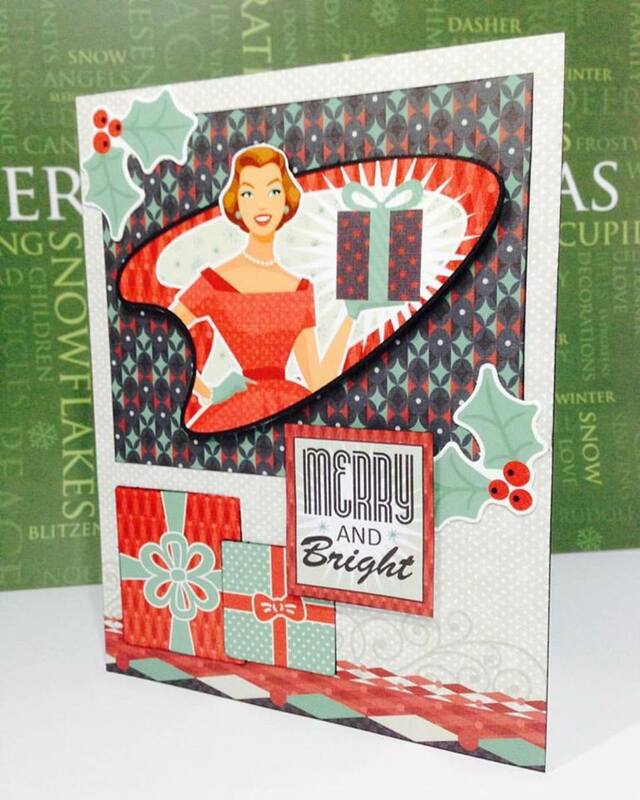 Here's how you can make this super-quick card. The things you will need for the birthday candles greeting card are as follows. 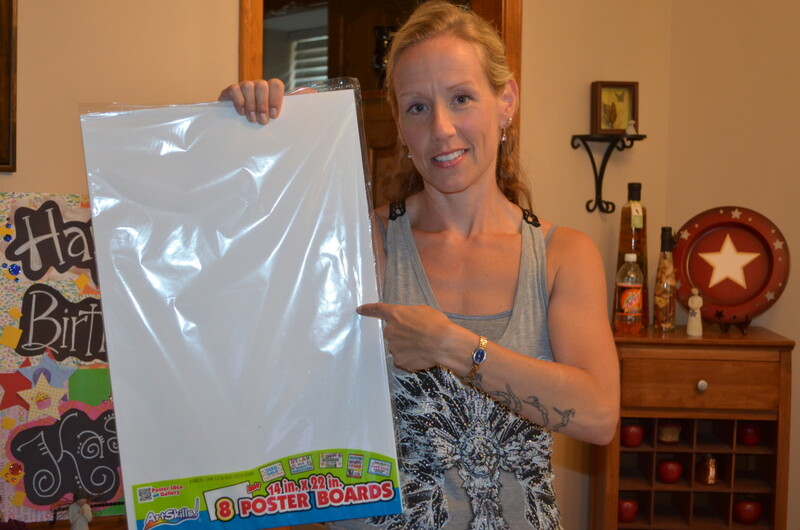 Take a rectangular white cardstock and fold it in half. This is the base of the card. Other colors of the cardstock can also be used. 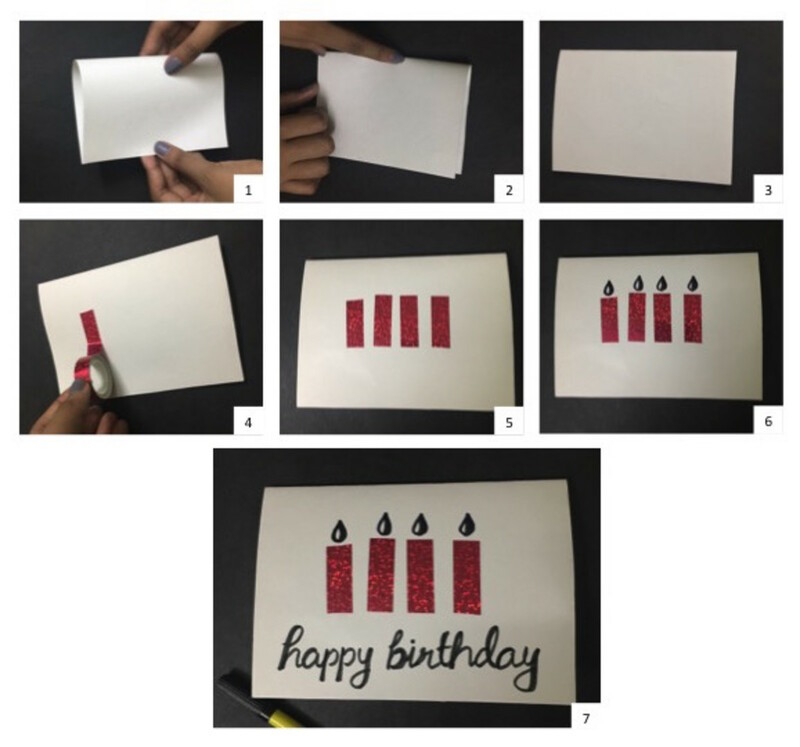 Take your washi tape and measure how long you want the candles on the card to be. Cut about 4-5 strips of the washi tape. 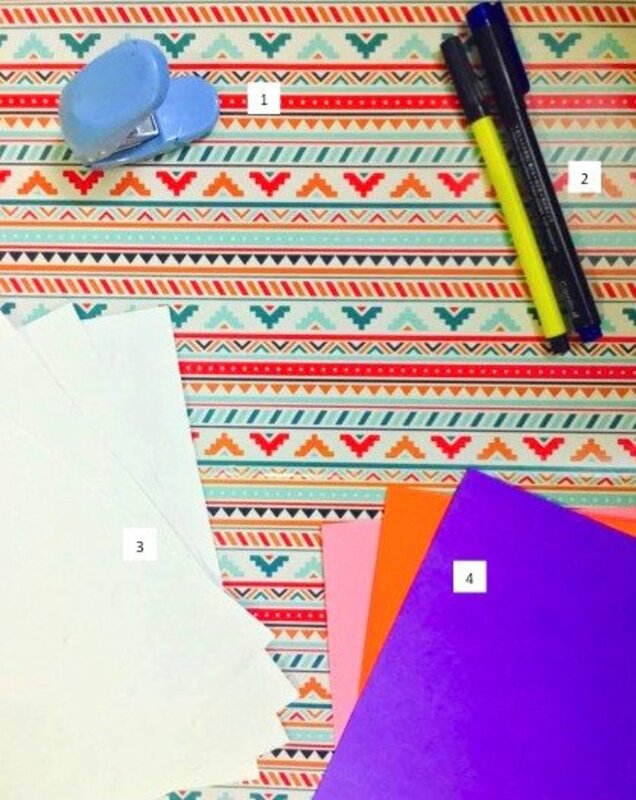 Optional: If you do not have washi tape, you can use colored sheets of paper or pattern sheets of paper available to you, and cut small rectangles to make them look like candles. Amazon has a great variety of washi tape which is available at a very reasonable price. Also, Amazon has a great variety of washi tape which is available at a very reasonable price. Stick the washi tape onto the card, one after the other, leaving gaps between the washi tape (candles). You may want to place them in a straight line or randomly (to give a feeling of dancing candles). Take your black marker or black pen and draw the flames of the candle just as shown. Your card is now complete. Super Duper Easy. This is such a fun-filled greeting card. This will also make a super-easy-to-make-card for Valentine's Day (you can replace hole puncher with a hearts puncher, giving you heart confetti). Here's how you can make it. 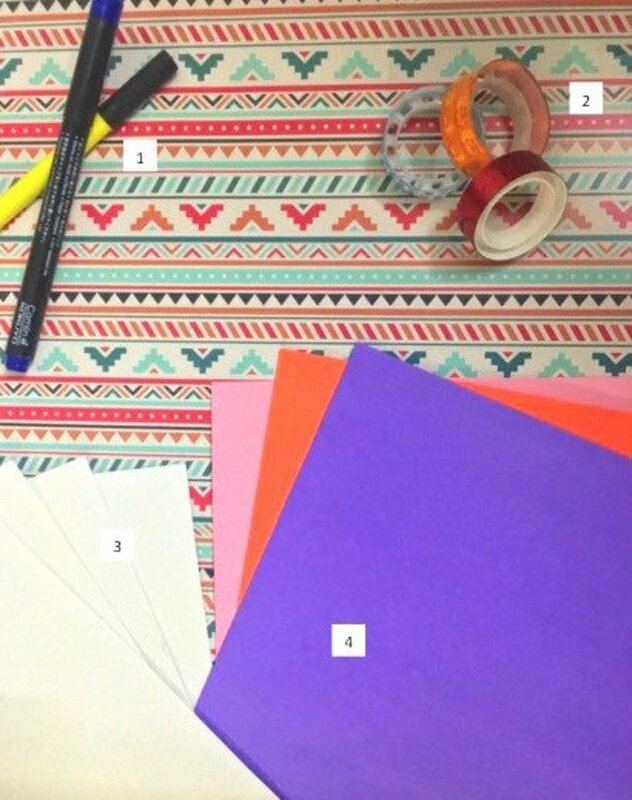 The things you will need for the confetti burst greeting card are as follows. Take your colored sheets and using a hole punch, punch out small confetti-like circles. I have used many colors, you can choose colors of the same color family, or choose just one color. You can customize it, according to your likes. 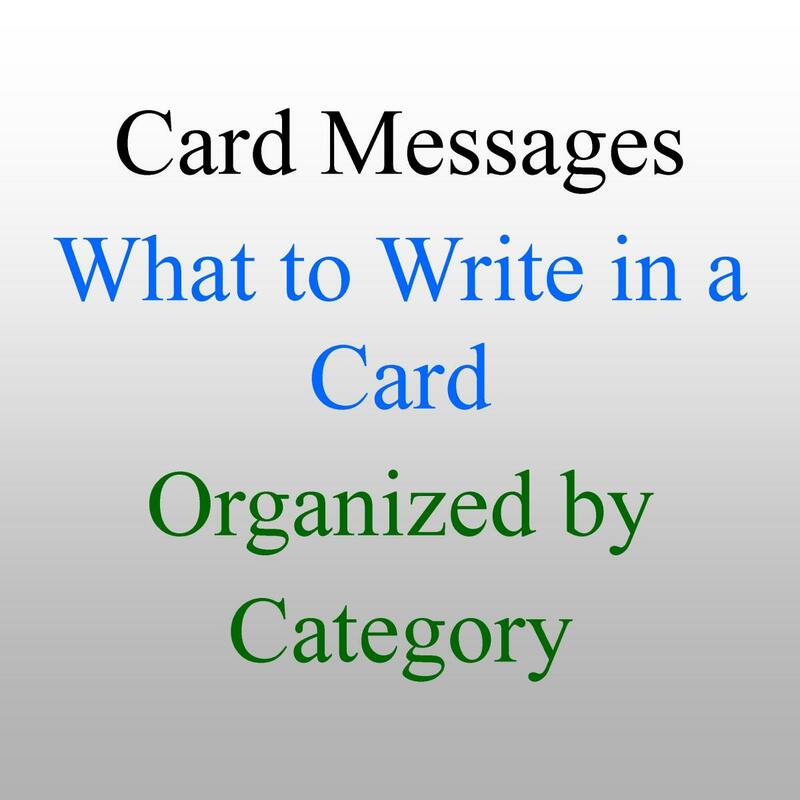 Write your message, like shown, in the center of the card using your marker. Now, take the multi-color confetti and using glue, start sticking them to your card, around the message. Tip: I would advise you to use a dotting tool like a pen or a toothpick or anything to apply glue to the surface of the small confetti to make the process easier. Voila! Your card is ready within minutes. You can definitely tweak these a little to make them even more unique. 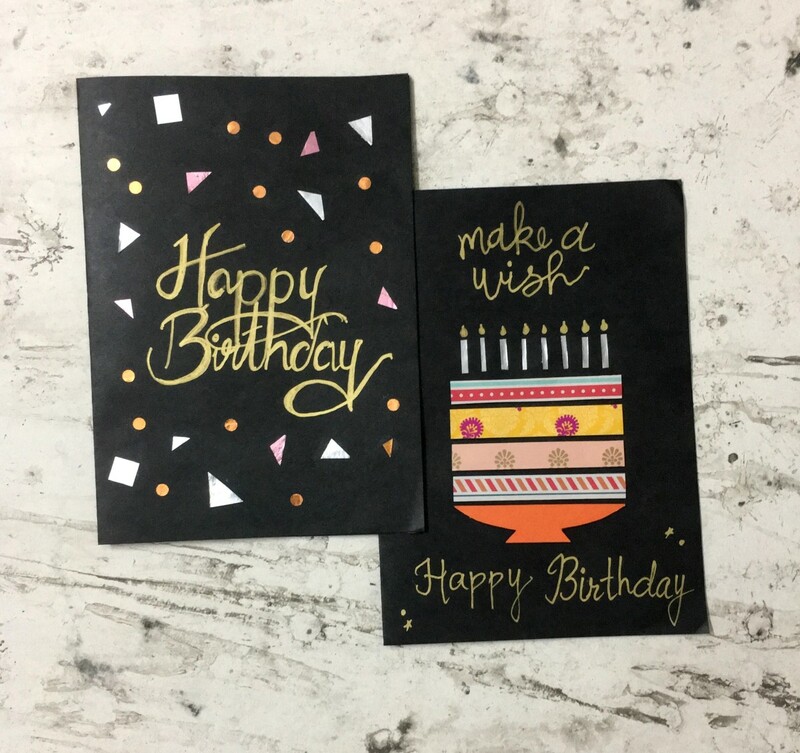 These greeting cards are not only perfect for someone's birthday but also would look great for other occasions and celebrations, like the Valentine's Day, Christmas, etc. 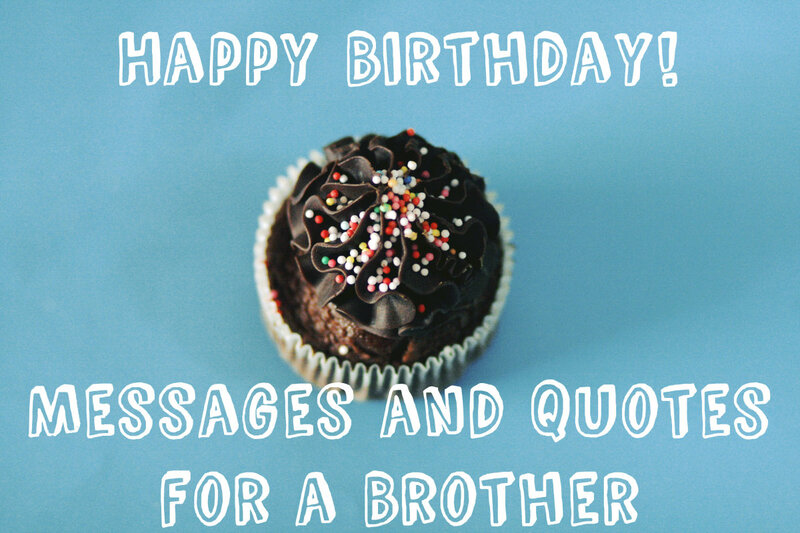 Just instead of writing Happy Birthday, write you favorite message for them on the top and you are done. Hope you enjoyed these ideas, and would try these at home. 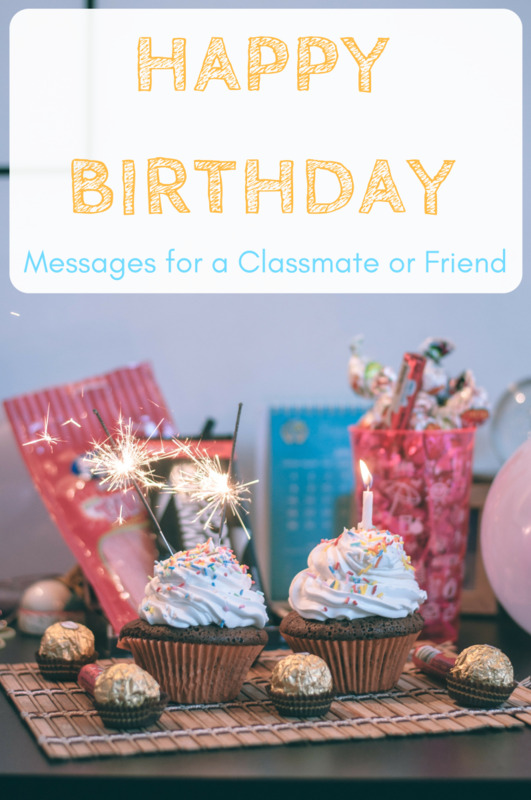 Which birthday greeting card idea are you going to try first?